This year we are working hard to update our trip dossiers. Our main objectives have been to make them clearer, easier to read and more streamlined. We have added live links so that information can be accessed more easily, directly from the document itself. The layout of the dossiers is now updated and we think that information will be easier to find with images, coloured headings and a new format. 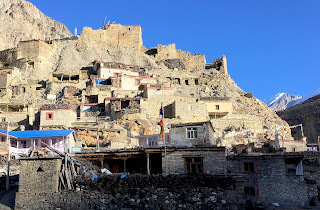 To take a look at our new Naar to Upper Mustang Trek Dossier. We have removed some information from the trip dossiers which is not trip specific. This information has been added to the country specific pre trip information documents which you receive once you have booked with us. We want you to choose the most appropriate trek for your ability and interest and a lot of this will be based on the trail. The more information you have about the kind of trail you will be trekking, the more easily you can decide whether the trek is suitable for you. 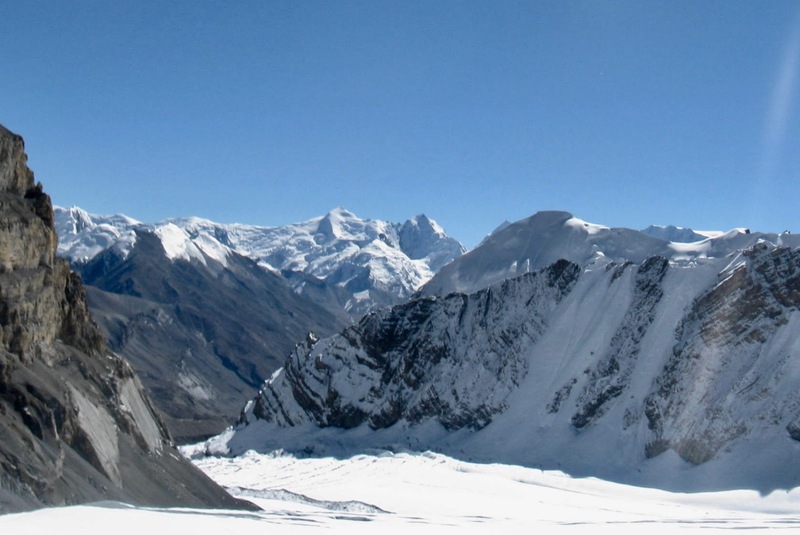 For example, trekking to K2 Base Camp is Glacial Moraine - generally rocky under foot but with some icy patches. Significant up and down. Whereas trekking to Everest Base camp has more Gently undulating clear trails through forests villages or gorges. We have created a classification system for the trails made up of 8 trail description categories and a visual way of representing it. To find out what the classification below really means, read our blog post “Picking the right trail for you” or look at one of our new trip dossiers. Last August we published the blog “what does your next adventure look like?” in which we shared our quest for more data. Some of that data is in and we have begun to add it to our dossiers. As we collate more of this data we will be able to add it to all our dossiers. Below is an example of the new easy to read format in which we are presenting the data. The maps Roland created last summer for our treks and linked to the website, are now also linked to in the trip dossiers. We are including an altitude profile in all our new trek dossiers. These will give you an idea of our gradual acclimatisation profile as well as how many passes you will encounter along the way. We would like to thank our clients (Mark, Neil and Bruce) who worked with us on the new Saribung Trip Dossier, providing valuable feedback as we improved these Trip Dossiers. We want you to choose the most appropriate trek for your ability and interest, and a lot of this will be based on the trail. Every trip organised by us has been given a grade based on the expected level of difficulty in order to help you select a suitable trip. We have six levels of grading for our trips: Easy, Gentle, Moderate, Demanding, Strenuous and Challenging. More information on the grading of our treks is on our website. This grading system is helpful but does not always provide the level of detail required to get an accurate portrayal of the trek. We have therefore set up a classification system for the trails made up of 8 description categories. This classification system is slowly being rolled out through our new Trip Dossiers. We have split the trail sections into lower altitude (below 3,000m), higher altitude (above 3,000m) and high altitude passes (over 4,000m). The type of trail within each of these categories is then split further depending on type of trail, exposure and ascent/descent profile. The descriptions are an indication of what you might encounter and it is important that you assess your personal capabilities based on the terrain you are comfortable trekking through. Undulating clear trails through forests, villages or gorges. There may be some bridge crossings and some short steeper sections. Longer steep sections (ascent or descent) on well defined trails. There may be some exposed sections of trail. Gently undulating clear trails through forests villages or gorges. Long steep ascent or descent. There may be some exposed sections of trail and rocky terrain with a less defined trail. Glacial Moraine - generally rocky under foot but with some icy patches. Significant up and down. This is a simple pass crossing with clear trails. It may take up to 4 hours to get to the top of the pass. This is a more challenging pass with a steep ascent or descent. There may be some exposed sections of trail and rocky terrain without a well defined trail. There may be snow on the trail and microspikes could be required. This is a technical pass or climb. Either crampons, ropes or technical skills will be required. Where will your next trail take you? 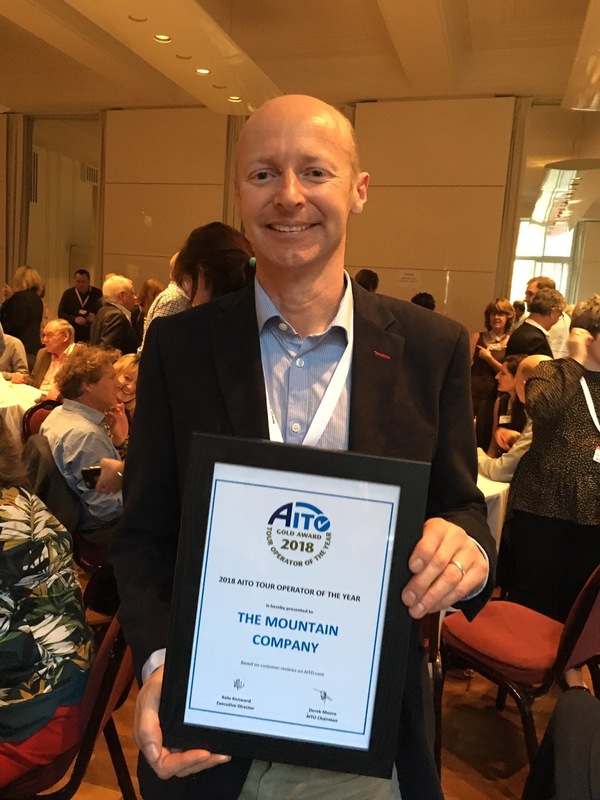 We are absolutely delighted to report that we struck Gold by winning AITO Tour Operator of the Year 2018 on Wednesday at the AITO Annual General Meeting held at Royal Over-Seas League in London. We won the Bronze Award in 2015 so it is wonderful to scoop the top prize in 2018! This means a lot to us as this award is based on our AITO Traveller's Reviews received during 2018 and we got more Excellent rated reviews than the other 122 members of AITO. 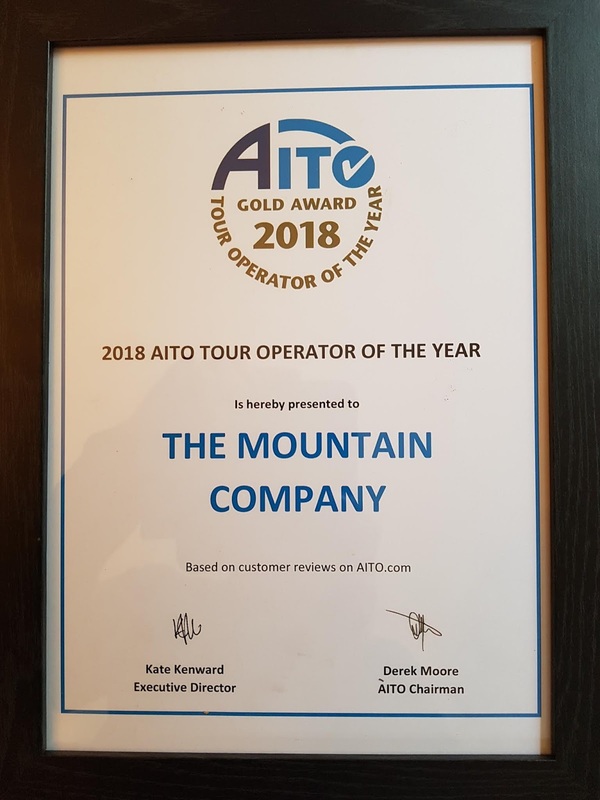 For those of you who do not know of AITO, this stands for Association of Independent Tour Operators ("AITO") and is known as The Specialist Travel Association. We always strive to organise the best holidays and it makes it all worthwhile when we receive positive feedback from happy clients. I would like to thank everyone who travelled with us last year and for those of you who sent in AITO Traveller's reviews. The Mountain Company became a member of AITO in 2014 so we are relatively new to this association however it has been one of the best decisions we made! 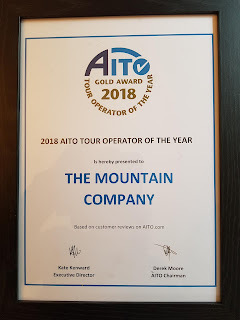 Of course we would like thank everyone involved in our operations both in UK and in our destination countries of Nepal, Bhutan, India, Pakistan and Myanmar for their hard work, dedication and professionalism to provide our clients with unique experiences in the Himalayas and Karakoram mountains. 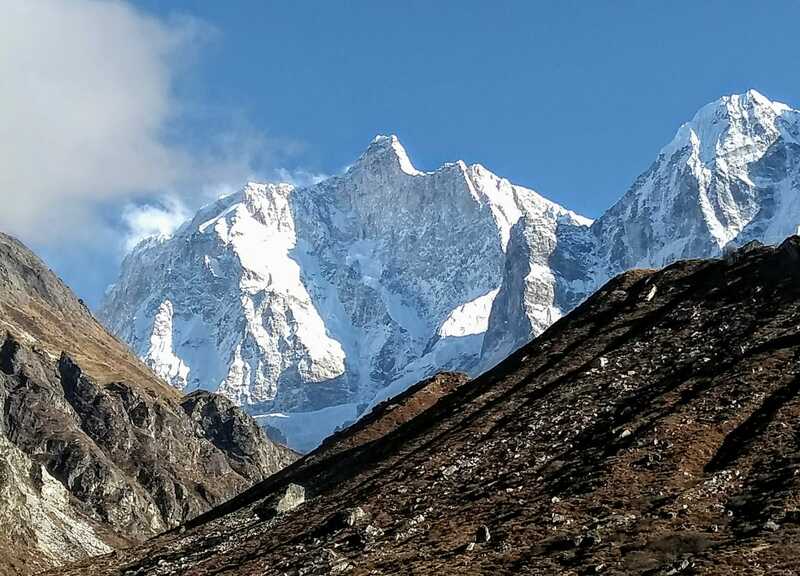 We are certainly not resting on our laurels as we have plans for a number of major improvements to our service in 2019 following the changes we pushed through in 2018 such as uploading all of our treks onto Google Maps (see View Map link in each of our trip webpages such as Everest Base Camp). We will continue to develop and expand our portfolio of trips to visit some of the most remote places in the Himalaya and Karakoram mountain ranges. If you are interested in joining one of our groups in 2019 please get in touch by email, phone at +44 (0) 1647 433880 or come to visit us near Chagford (Devon) in the beautiful Dartmoor National Park. Association of Independent Tour Operators’ (AITO) Project PROTECT recognises the important role that destinations play in the future of the travel industry. The aim of this project is to encourage sustainable tourism and to nurture the destinations for tomorrow's travellers. The PROTECT acronym stands for People / Resources / Outreach / Tourism / Environment / Conservation / Tomorrow. This project is led by Professor Xavier Font of the University of Surrey and each AITO member has to publish an annual pledge and report back through a Testimonial at the end of the year on how they got along. In 2018, we will ask each trekker booked onto a trip with us to pick up one kilogram of rubbish. During 2018 we will have approximately 200 trekkers travelling with one of our groups in Nepal, Pakistan, Bhutan and India and we will therefore pick up at least 200kg of litter." "In 2018 the Mountain Company’s groups removed 320kg (average 1.6kg per person) of rubbish from the Himalaya. We have also incorporated rubbish collection and disposal into our standard operating procedures for our destinations of Nepal and Bhutan. In 2018 we decided to build upon our 2017 pledge by collecting more rubbish from the trekking trails and campsites of the Himalayan countries. Our groups removed 320kg of rubbish from the Himalaya and this works out at an average of 1.6kg per person booked onto trips with us in 2018. We have also looked into better methods of extracting our own rubbish from the mountains and this year for our Lunana Snowman trek in Bhutan we used ponies to pack out 65kg of our waste to the road head. We also wanted to reinforce the importance of rubbish collection and disposal to our trek guides and crews by incorporating this approach into our operating procedures so this will be standard practice for The Mountain Company groups in future years. I have noticed a change in attitude to rubbish collection among our trek crew from guides through to porters. The trek crew have picked up a large proportion of the rubbish collected this year and have set a great example to our trekkers. Our guides and cooks have frequently walked around the campsites to collect the rubbish scattered around and discard along with the waste generated by our group. Over the last two years we have been pleased to notice an improvement in the environment on the Himalayan treks. 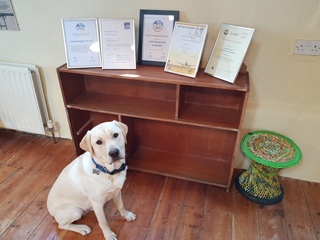 We also seen more focus and attention on this issue from organisations based in these countries such as the Bhutan Tourism Council and the Sagarmatha Pollution Control Committee in Everest region of Nepal having both organised clean up expeditions. However with increasing numbers of visitors to these remote places there is still much to be done to improve the environment." 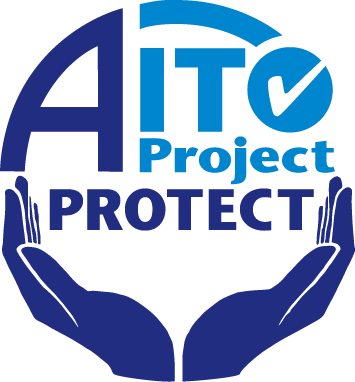 Thanks for everyone's help and support with our AITO Project Protect in 2018 and 2017. This group was led by Natalie Wilson (UK) and this was her fourth time leading this classic trek around the world’s third highest mountain. The Nepali sirdar for this group was Raj Tamang from Taplejung, he also worked as sirdar for our April 2018 trek around Kanchenjunga Circuit. The assistant guides were Bal, Jon and Sagar. The cook was Sangram Lama who has worked with us for many years and always produces high quality and tasty food for our groups. For our late October 2018 Kanchenjunga Circuit group we had ten trekkers coming from UK, Australia, New Zealand and South Africa. 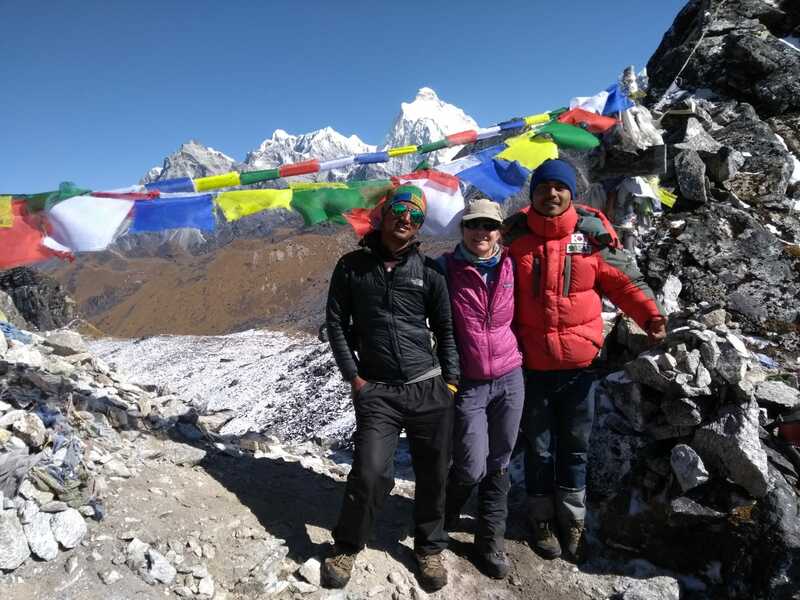 “The trip was really successful - most of the group made it to either Pang Pema, Oktang or both base camps and we experienced excellent weather throughout - no rain, light winds and a lovely sprinkling of snow overnight at Selele before the three passes. The food was excellent, the crew organised, hard working and friendly and the group got on really well together. People loved the variety of terrain we passed through - from quiet villages, cardamon plantations through to the high ground with it’s cold nights, stark rock and snow capped mountains. We saw eagles, blue sheep and other wildlife. The food was excellent and varied. Sangram and crew did a fantastic job and the group were very impressed. Many of the group commented that they hadn’t expected such stunning scenery all the way and they were impressed with all the crew and how the logistics of the trip work." Throughout the course of Kanchenjunga Circuit trek we received bespoke weather forecasts from Michael Fagin at www.everestweather.com and this information was sent through to Nat on her satellite phone for days before approaching Kanchenjunga northside Base Camp and before crossing the Mirgin La. Having professional weather forecasts is essential for safety in crossing high passes and for decision making in the field. 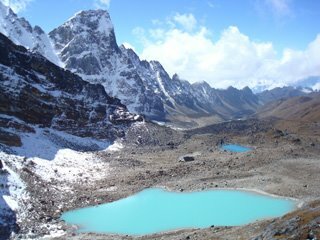 "A long three week trek in a remote part of Nepal visiting Kanchenjunga North and South base camps. 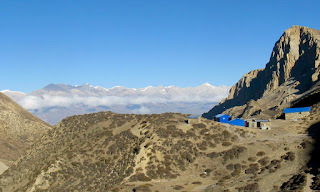 A very well organised camping trek with the group supported by a hard working team of guides, cooking staff and porters. A mix of climates from temperate forests to cold high altitude tundra surrounding Himalayan mountains. Spectacular scenery. A special place. The Mountain Company is a well organised and highly professional tour operator specialising in trekking holidays in the Himalayas. They pay special attention to ensure the safety and welfare of the trekkers. Highly recommended." Thanks very much to Natalie and Raj and the rest of the team for their hard work leading and organising this trek. Our next departure for Kanchenjunga Circuit is in April 2019 and followed by late October 2019. There is currently availability if you are interested in joining this group, please get in touch with us soon. The cook, Tandim Sonam, and his kitchen helpers did a superb job and we have received positive feedback from the group on the quality and quantity of food. We have worked hard over last few years increasing the food provisions for Snowman. In Summer 2017 we imported a food dehydrator machine from USA into Bhutan and this has help increase the quantity of vegetables supplied whilst on a long and remote trek like the Snowman trek. As Almas says overall the weather and conditions for Snowman 2018 were favourable. The timing of this trek is very important in order to increase the chances of successfully completing the full traverse from Paro to Bumthang. From organising Snowman trek ten times since 2008 we have developed a good understanding for the optimal time to start the trek. By the last week of September the monsoon should be winding down and this places the group in Lunana around mid-October hopefully before the winter snows block the exit passes out to Bumthang. Throughout our Lunana Snowman trek we receive bespoke weather forecasts from Michael Fagin at everestweather.com and this information is sent through to Almas on his satellite phone. Having professional weather forecasts is essential for safety in crossing high passes and for decision making in the field. We track all of our groups in the field with GPS check ins from Thuraya satellite phone and this year we have started using Google Maps in real time so friends and families can follow their progress - you can see the Google Maps for our Lunana Snowman 2018 trek . We made one change to the logistics for this year’s Snowman trek by changing our horses at Laya whereas last year we took horses from Paro all the way through to Bumthang. Almas told me that the horsemen from Laya have strong, healthy horses and in the years we took horses from Laya all the way we noticed the horses got tired by the end of the trek. We have now launched the dates and prices for Lunana Snowman 2019 on TMC website and this departure is now already guaranteed to run. Please get in touch with us soon if you like to join our Snowman 2019 group. After leading the Naar to Upper Mustang trek in October 2018 I left the group in Lo Mantang and turned back, towards Saribung Pass and down to the village of Phu. Galden Sherpa and I were going out to check the trails and best camping locations with a small support crew. 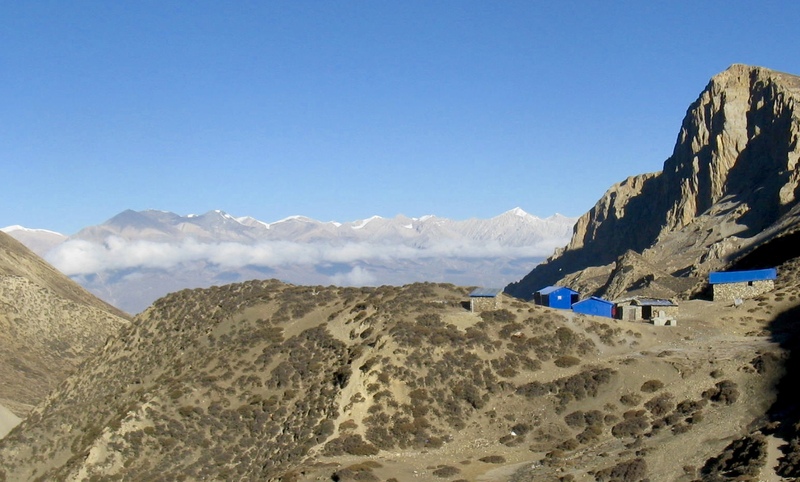 Most companies run this trek starting from Lo Mantang over to Phu. 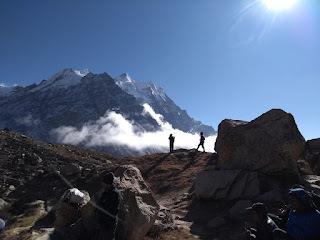 We wanted to see if it is possible to acclimatise better doing this expedition in the opposite direction by crossing the pass from the Phu side and finishing in Lo Mantang. One reason for wanting to run the trip from the Phu side is that assuming we could find good campsites in gradually ascending locations, it allows for a slow ascent with a rapid, safe exit if necessary. Whereas approaching Saribung from Lo Mantang entails crossing three passes of around 5,000m early in the trek. This means ascending too high, too fast with risk of altitude sickness for both group and crew. If there is bad weather it raises the risk of not even getting near Saribung if the passes are blocked with snow. Another reason for looking at this option is to be able to spend time in the beautiful Valley of Phu. While Naar and Phu have become more popular and teahouses are being built to accommodate this, very few trekkers explore the valley north of Phu. Most of those that walk these trails are heading down the valley having already crossed Saribung pass and therefore spend little time in the area. 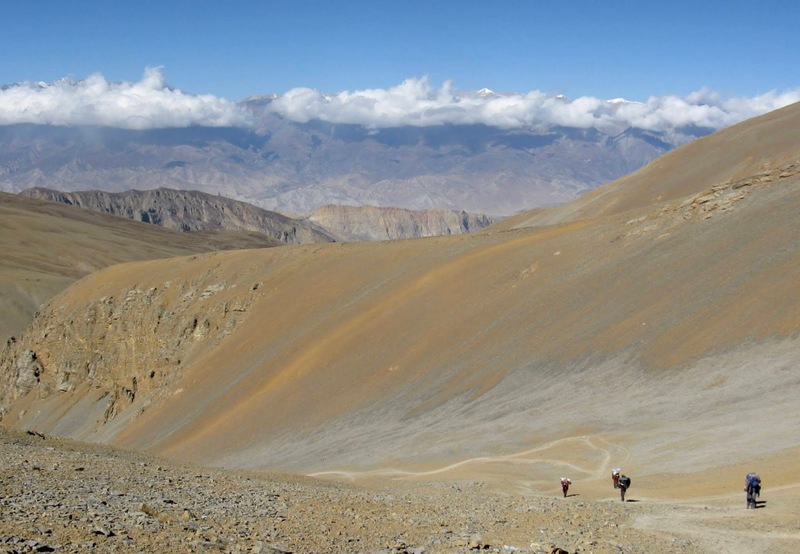 Our first day from Lo Mantang took us back to Yara Gaon - a trail we know from the Naar to Upper Mustang trek. After that we were in new territory. The three passes to cross between Saribung La and Yara take you away from the Upper Mustang region with its colourful arid terrain in varying formations and towards the high plateaus. 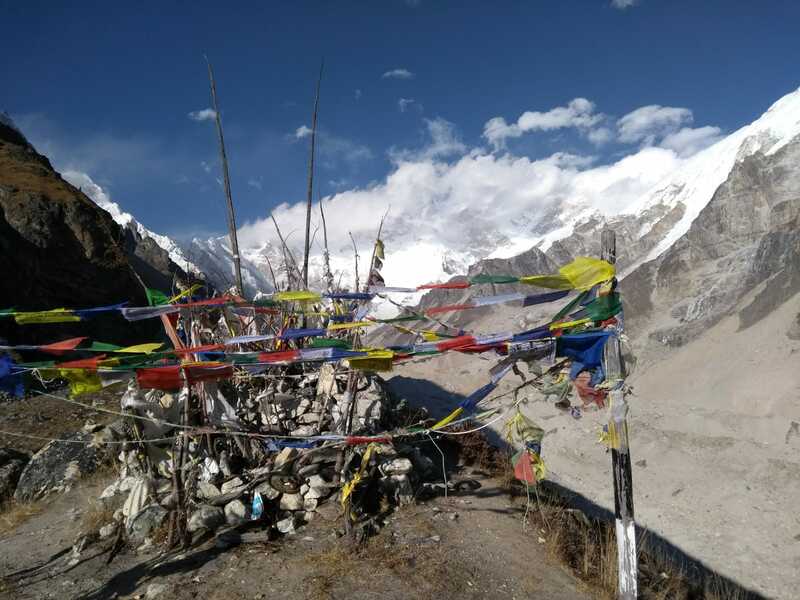 The views from the three passes (4,950m, 5,300m and 5,400m) are as varied as the land you are trekking through, with Upper Mustang stretching out below, the majestic Dhaulagiri, the Tibetan plateau and the peaks of Damodar Himal. The trail over these passes is very clear and regularly repaired and improved because it is highly frequented by Hindu Pilgrims in order to reach Damodar Kunda. 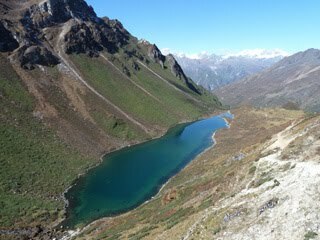 It is popular to carry out the Pilgrimage to this holy lake close to the Nepal Tibet border in August and Lord Krishna has said that he who pays a visit to and takes a deep-bath will be free from all sin. Beyond this we find the glacier and the pass. There is significant glacial moraine to walk across - more on the Phu side than the Mustang side. For this reason and in order to acclimatise safely, I identified a number of camping options on the glacier. 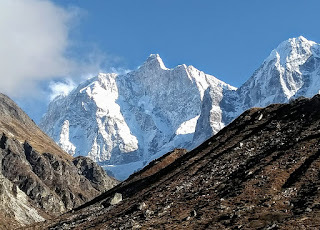 We will camp at three locations on the glacier - Bhrikuti Base Camp (5,070m) which is right at the beginning of moraine, Moraine Camp (5,339m) which is part way up - there are a number of locations which have been flattened out and are suitable for camping here and finally Saribung High Camp (5,684m) which will put us in position to cross the pass safely. On the Mustang side the section of moraine is shorter and we have decided to descend to Japanese base camp after crossing the pass. We have the exact locations of these camps as throughout the recce, I was sending regular GPS checkins back to Roland from the satellite phone. He uploaded each location I sent him onto Google Maps set up for Saribung Expedition and we used these waypoints to help finalise our itinerary decisions. The pass itself is crevassed and all of the crew and I went over with crampons and fully roped up. A lot of the crew are unfamiliar with these techniques and we will work with them lower down the valley to ensure everyone is safe and confident in the crevassed areas. On this recce, after crossing the pass we descended to Bhrikuti Base Camp which is a long way down. From here I wanted to explore a small pass that looked like it could easily take us over to the next valley and Pokharkang Base Camp. The pass was easy to cross and the valley leading to Pokharkang Base Camp is beautiful and very peaceful. In this quiet rarely visited valley we saw big herd of blue sheep and not much else. It is a great place to acclimatise with good options for higher walks. In order to make the jump from Nagoru (4,442m) to Pkharkang Base Camp (5,030m) more safely, I found a spot part way up the valley which had obviously been used for camping before. This camp, which we have called Pokharkang low camp is at 4,840m and will give us the gradual ascent we want towards the pass. From here, Galden and I joined back with the main trail just above Nagoru. This abandoned village has plenty of large flat areas and is a beautiful camping spot. If you look carefully there are caves above the village and we saw a herd of over twenty blue sheep grazing on the hill above the village. Despite being uninhabited, this remains the first village until Yara on the other side and it feels like civilisation. Between Nagoru and Meta there are a few village like this and we will stay at Kyang on the way up to Phu as part of our acclimatisation process. As Kyang is down the valley from Phu, there are a number of trekkers wanting to stay and although the village is abandoned, teahouses are slowly being built. Finally, many people come to this Valley just to visit Phu and it is worth a visit in itself. The medieval Tibetan village is perched on the hillside with narrow alleys twisting and winding between houses which were built closely together. 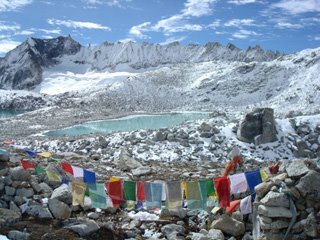 I am looking forward to spending an acclimatisation day here when I return in the Spring as I didn't have time to visit the Tashi La Kong Gompa or do any of the numerous acclimatisation walks possible. We are running small recce for up to six clients in the Spring 2019. Here is more information and a full itinerary which has been put together based on this recce.